Royalty Core's Incredible RC1X Grille features an integrated insanely powerful Vision X LED light bar bordered within the grille design and mounted in a closed loop adjustable system. 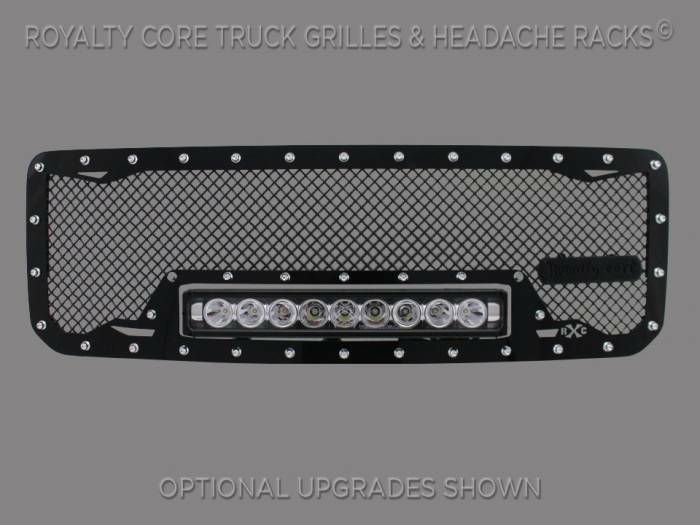 This grille includes a 19 inch Vision X XPR-9M LED light bar. Including a weatherproof Deutsch connector with plug-and-play, polycarbonate lens, and isolated rubber mounts for vibration control. The XPR Series provides a powerful distance that is comparable to HID with all the benefits of the LED featuring a 50,000 hour lifespan. Being manufactured from extruded 6061 aluminum, the LED is tough enough for all conditions. The front has the ultimate protection of the unbreakable polycarbonate lens, while the bottom has the Vision X trunion bracket for mounting.